Email templates are used for automation and consistency when working with customers, drop shippers, affiliates, etc. Event driven notification emails can also be sent using the email templates. Email templates can also be populated with merge codes. This is useful for customizing the email with information, such as order details or the customers' name. To create or modify existing templates browse to Marketing > Email Templates. You can either select the template you wish to edit or click the New button to create a new template. A few templates create by default when you open your AmeriCommerce online store. You can edit settings for all email templates as per your requirements. Sent to customers/potential customers who started an order but for whatever reason didn't finish. Sent to affiliates when their application is accepted and approved by you. Sent to affiliates whose applications are not approved. Sent to affiliates confirming that their affiliate application has been received. Basic template to start from when sending download/access instructions for e-products. Sent to purchaser of a gift certificate. Includes instructions on how/where to access their gift certificate. Sent to the receiver of a gift certificate. Includes instructions on how/where to access their gift certificate, as well as who bought it for them. Sent to the receiver of a gift certificate. Gives information on how/where to access their gift certificate. Sent when "reset password" is requested, with instructions on how/where to reset password. This template is sent to a drop-ship warehouse when an order is placed on a product that is to be shipped from there. The template includes order details like customer contact, order id, items, shipping address, etc. Sent to the author of a new product review. It Explains it may need to be moderated and also confirming the details they submitted for the review. Sent to customers when the status of their order changes to "cancelled". Sent to customers when an order is placed. Includes order details which are populated using merge codes. Sent when the status of an order changes to "Shipped". Used when the payment specified by the customer is declined for any reason. Sends an email when a dropshippers' payment is succesfully received. 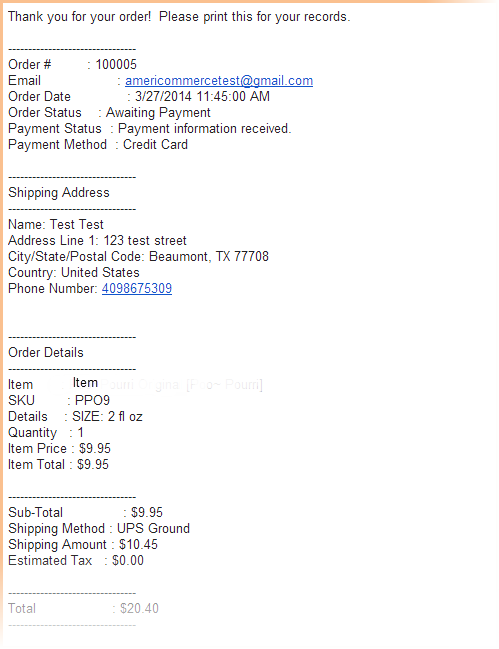 Sent to receiver of a quote cart with link to quote cart created. If a customer registers as a new user on your store this email template is used to send a registration confirmation. Sent to author of a review once it's been moderated and approved, along with a link to their now published review. You can modify and customize your email templates here with custom text and merge codes. The following descriptions and snapshot provide more information on how you can modify your templates. You can use the merge code ##STORENAME##. This pulls the store name as specified in your Store Settings. You can also enter it manually if desired. You can use the merge code ##STOREEMAIL##. This pulls the store email as specified in your Store Settings. You can also enter email address manually. You can choose between TEXT or HTML for the format to send your email in. The subject of the email being sent; you can use merge codes here as well.. The main body of the email where you specify the content of the email. You can use text as well as merge codes to personalize the email. This is the subject of the alert email sent to the store admins. It is a copy of the email sent to the customer but can have a different Email Subject. Enable this box to send alerts to the store admins. This keeps you notified with a copy of the email. Commonly used to get a copy of order notifications, customer registrations, abandoned cart emails etc. 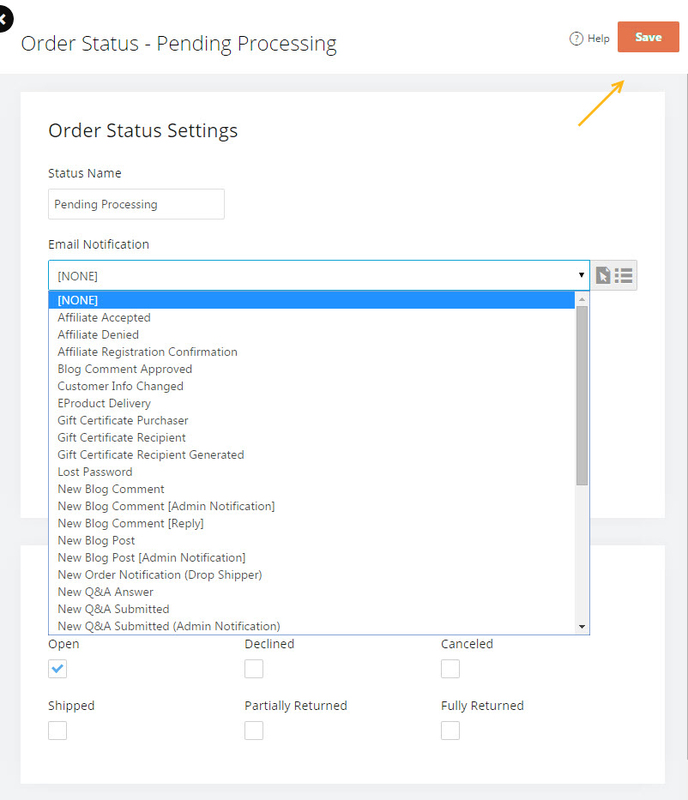 Admin emails have extra options for order specific information not visible to the customer. Here you can specify details about the session id, source, search phrase etc. It can be populated with merge codes as well as text. It gives a quick overview of the source of the order, search phrase used, the PPC campaign, Ad campaign information etc. The admin email alert addresses receive a copy of the email sent to the customer, along with the information in the Alert Email Header. The Alert Email Header is sent only to the email addresses specified under Global Settings > Email Alert Addresses. Click on the View Site Merges link to view the available merge codes that you can use inside the email template. When you insert a merge code it is replaced by the value it represents. For example, ##ORDERID## is replaced with the order number. Many email merge codes are available. Please review the knowledgebase articles 'Merge Codes' for a list of all available merges. Please Note: Only the email based merge codes will work in email templates. Merge codes are specific to certain areas of the site. Once you have the email templates created, you can define settings and events to trigger an email automatically. 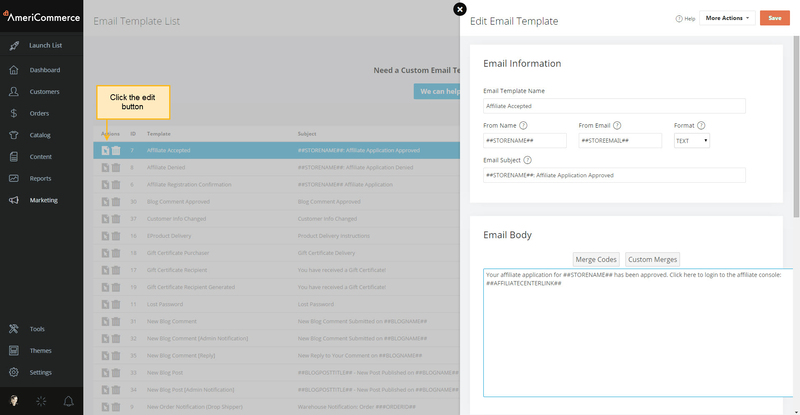 Each feature that can have an email assigned will have a setting in it's configuration. Here are a few examples of where you would choose a email template for a function. Under the Email Notification menu, select the email template you wish to use. Select one or more customers you wish to send an email. (Note: Use filters to drill down to a specific list of customers. Click More Actions in the top right. 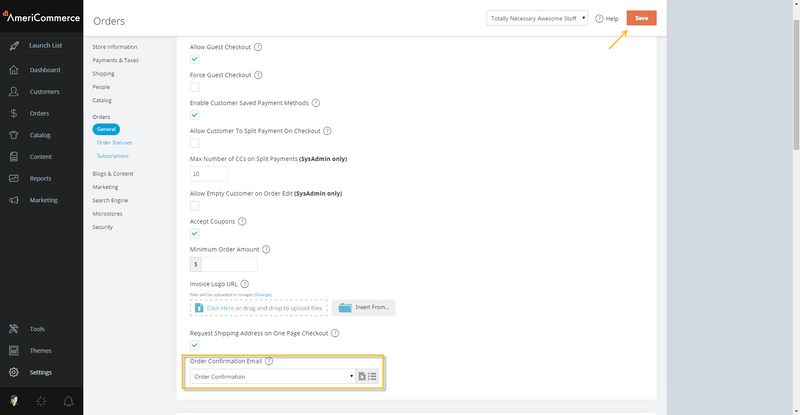 Send Email Template will allow you to send the selected email template directly to the selected customers. Write Email will allow you to manually edit the email template. This is when you want to send it without permanently changing the template. You can also change whether the email is sent from the store email or if it is sent from the Current Admin User's email. Under the menu for Order Confirmation Menu, select the template for the Order Confirmation. Order Confirmation is the default selection. Note: If you select Order confirmation template in Store Settings > Email settings as well as in Orders > Order Statuses then you/your customers will be receiving the same email twice.